Before getting started, I have to say something, something rather catty — which is that Jennifer Scott makes me jealous. I’m jealous in part because she has self-published a book, Lessons from Madame Chic: The Top 20 Things I Learned While Living in Paris, that is doing very well for itself. Nearing the top of Amazon’s Paris Top 10 list, it has just been reviewed by The New York Times (Thursday Styles) and featured in The Daily Mail. But a much bigger part of the reason for my jealousy of Scott is that she’s such a quick study. Let me explain. As an American woman who lived in England and Japan for many years, I could identify with many of the lessons Scott picked up from immersing herself in the everyday life of a fine French family: that there are other — more stylish and more sensible — ways to cook and eat, keep house, entertain, wear clothes and put on make-up than those we’ve been taught in our native land. But just how long was Scott in Paris? Six months! C’est incroyable! It took her just six months to pick up so many life lessons? At first I wondered: can it be because the French are such good teachers? Scott after all benefited from exposure not only to her host family, whom she calls Famille Chic, but to her boyfriend’s host family, Famille Bohemienne. Really? But it’s a silk and cashmere blend. It does not suit you at all. It washes you out. You look…sallow. For Scott, this is the beginning of an epiphany. She feels wounded but then has to concede that Mme Chic could be right — she’s never liked the sweater (it was a gift) but more importantly, why is she bothering to wear colors that don’t suit her? For the past four years — initially through her blog, The Daily Connoisseur, and now through her new book — the precocious Scott has been making the case for rejecting the typical American life of mindless consumerism. As she learned at the well-manicured feet of Mme Chic, it’s important to make sure the clothes you wear, the food you put into your body, and the items you bring into your home are things you love and that actually suit you. What’s more, living a well-edited life frees up our time for other — artistic, cultural, intellectual, philanthropic — pursuits. Such sage advice — and from one so young! But enough of my giving vent to the green-eyed monster. It’s time I introduced you to its object — or shall I say, bête noire? — the très très charmante Jennifer Scott. She graciously agreed to answer some of my fashion- and style-related questions, along with a few that relate to the concerns of the Displaced Nation’s “citizens.” The following are some highlights from our exchange. Enjoy — and see if you don’t end up with a case of Scott envy as bad as mine! Thank you so much, Jennifer, for agreeing to this chat and also for generously offering to provide two signed copies of your book as a giveaway to Displaced Dispatch subscribers. Let’s start by having you talk a little about your background — where you were born, what you studied and why you went to Paris. I grew up in the Inland Empire of Southern California, studied theatre and French at the University of Southern California and currently reside in Santa Monica. 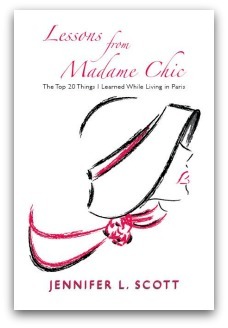 My junior year of college I studied abroad in Paris, which was a life changing experience and prompted me to write my memoir/lifestyle book, Lessons from Madame Chic. What made you decide on the format of a how-to book — which as you say is also something of a memoir on your semester abroad? Since 2008 I’ve been keeping a blog called The Daily Connoisseur, where I explore all facets of how to live well. I did a series on my blog, “The Top 20 Things I Learned While Living in Paris,” where I examined the lessons I learned in Europe and shared how I translated those lessons to my California lifestyle. The series was so popular, I realized there was a strong interest in the application of these lessons — not just in the lessons themselves — so I decided to record my observations in a book. The audience I had in mind was anyone who wanted to live a more refined and elegant lifestyle. I know this sounds broad and general but it’s true. Sure, different parts of the book appeal to different people and age groups, but overall the message is that life should be lived beautifully and passionately and I think that is a universal message. What portion of the book — the fashion and beauty tips, the lifestyle advice, the memoir — have readers responded to the most? Most readers say the last third of the book, the section on how to live well, inspires them the most. But I get a lot of great feedback on the beauty, fashion and diet portions of the book, too. I really liked your advice about the capsule wardrobe of 10 core items, based on how Madame Chic and her family dressed. But many of us who’ve been expats in other countries eventually find ourselves drawn to native fashions — sometimes to the point where we start building collections. Last week, for instance, long-time expat Anastasia Ashman told of her collection of silk kebayas (long, fitted jackets) from Malaysia. Are fashion collections a no-no? I think the idea of a fashion collection is very cool. I don’t personally have one but if you have traveled, or if you live abroad and find yourself drawn to a cultural fashion piece, I say, why not? My only advice would be to make sure your collection is not verging on becoming clutter. Still keep a discerning eye. Another famous displaced American woman, of course, was Jackie O. What about her habit of buying ten sweaters in different colors — thus saving time and/or disappointment when the style is discontinued, or in the case of international travelers, for fear that you’ll never get to that part of the world again? This mentality can be tricky and I say that from firsthand experience! A few years ago I realized I was buying everything in threes. If I liked something, I would buy it in three colors for fear I would never find something like it again. I found that the multiple purchases just became clutter in my wardrobe and oftentimes I would change my mind down the line and decide I didn’t actually like the pieces that much after all! I would suggest practicing restraint here as well. I enjoyed the passage of the book where you recalled Mme Chic criticizing you for wearing the wrong color. When I had my “colors done” in Japan, I was told in no uncertain terms never to wear fuchsia! At the same time, though, I can relate to another remark made by Anastasia last week. She said that because color choice reflects the place where ones live, people like her, who’ve gone back and forth between very different cultures, find themselves varying their palettes rather widely. I do agree that color choice can be influenced by geography, but I believe one should always go with their passion rather than trying to conform too much. If you love color, by all means you should wear it, even if everyone around you is in a sea of black. Style is about being happy and comfortable with what you are wearing, if you are trying too hard to fit into your surroundings, it doesn’t come off as natural. Moving on to skincare, in your book you mention how careful you are to apply SPF to your face, neck and décolletage — but is that a habit picked up in the U.S. or in France? I was under the impression that French women liked their suntans! Applying sunscreen is a habit I picked up in the United States but I do believe French women protect themselves on a daily basis with sunscreen as well — they perhaps aren’t so zealous about it as we are. Although everyone is different. I remember when I spent six weeks in Cannes, I loved to observe this French woman (a local) who went to the beach everyday to sunbathe. She was a deep bronze color and her skin was quite leathery so she clearly wasn’t concerned about wearing SPF! I adore tea time! I actually spend a good part of every year in England, as my husband is English, and we have tea and some sort of cake or biscuit every day during this charming ritual. Tea time is enjoyable and if you relish it and take it in moderation (only one slice of cake and not two) there is nothing wrong with it. Maintaining a healthy attitude towards eating and not beating yourself up over small pleasures is key. The French equivalent of tea time would be the goûter, which is taken at 4:00 p.m. and can consist of anything from a cup of tea and a slice of cake, to a hot chocolate and a biscuit. Delightful. Like me, despite your love of foreign countries, you’ve chosen to live in the United States. Have you changed your mind about any of the fashion principles you learned in France since coming back here, or do they still hold fast? I still utilize the fashion tips I picked up in France through the years — especially the French concept that comfortable doesn’t have to equal frumpiness. By necessity, I have to wear an orthotic most days. I still wear chic day shoes like ballet flats and driving loafers, but buy them in bigger sizes so my orthotic fits. Voilà! Comfort and practicality meet style. I love being comfortable but for me it’s about being creative and going about it with style. There are so many comfortable yet stylish alternatives to traditionally comfortable things like sneakers, sweat suits and yoga pants. So are there any fashion or beauty ideas that American women get right? American women have great style and get a lot of things right! I think where we go wrong is in editing our wardrobe. We have too many things in our closets and sometimes that clouds our fashion identity a bit. Moving on to another topic of interest to many “citizens” of The Displaced Nation: cross-cultural marriage. You’ve chosen to marry an “eccentric” Englishman, as you call him in the book. What do you think is the biggest challenge about marrying someone of another culture? The biggest challenge, for me, is food! My husband and I have very different tastes in food. He loves traditional English food like roasts, fish and chips, shepherd’s pies and other hearty dishes. I tend to like lighter fare. I also adore Mexican cuisine as it plays a big part in California culture and he is not so into it. So when we cook dinner at home, it is always a compromise. One more question from an expat perspective: have you completely readjusted to living in the United States, or do you still pine for Europe? I have definitely adjusted back to American culture. I love my Californian lifestyle — which is why I’ve chosen Santa Monica as my main place to live. It’s been over a decade since I’ve lived in France but I still travel to Europe every year. I enjoy taking the best lessons I learn from these travels and incorporating them into my life back home. This is really what my book is about. And doing so has helped me to lead a very rich existence, indeed. Finally, what’s next on the writing front — are you currently working on another book? My next book is a mystery called Divina Wright and the Case of the Missing Rubies. It is a stylish, vintage take on a modern mystery. STAY TUNED for Wednesday’s interview with another displaced style maven (but providing an Italian perspective! ), Barbara Conelli. I’m with you ML, that’s the kind of effortless elegance I aspire to… as I sit in unflattering reading classes, a less-than-clean hoodie and hideous slippers, contemplating a pile of unwashed dishes from my woefully disorganized desk. glasses, I mean. I’m not sure how I would get classes on my face. Oh yes, I I need to snow… I mean KNOW, that too! American women have great style and get a lot of things right! So I really don’t think anti-Americanism is her point. She goes on to say that our main problem is that we have too much — and it took the experience of getting fully out of this culture and immersed in another for her to see that. I can identify with that experience 300%. Maybe other Americans learn how to edit their stuff without ever leaving the country, but for me it was inspirational to see how people with less space in Europe (in my case, England, not France) and Asia (Japan) manage with less. I guess that one interesting question might be whether if Famille Chic found themselves transplanted to the United States, they might be tempted to buy more? I mean, just as Jennifer realized she had to cut down on her clothes as the French family was giving her just one small wardrobe, would Famille Chic ever be tempted to buy more clothes if they had a California-sized closet? Isn’t it natural to expand to fill one’s surroundings? And doesn’t self-discipline become more of a challenge in a culture that has more?